Adrian Madriz Espinoza is a local Duelist from Guadalajara, Mexico. 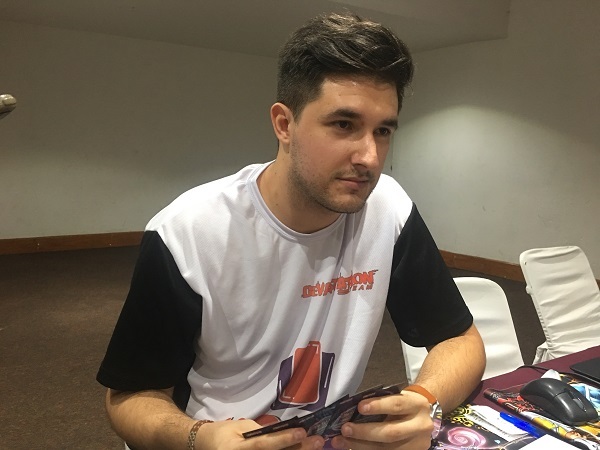 He won YCS Costa Rica this past March and won YCS Mexico City in 2016. Now he’s looking for his first World Championship invitation and hoping to get there with his Pendulum Magician Deck! Adrian Madriz Espinoza is the only Pendulum Magician left in the tournament. 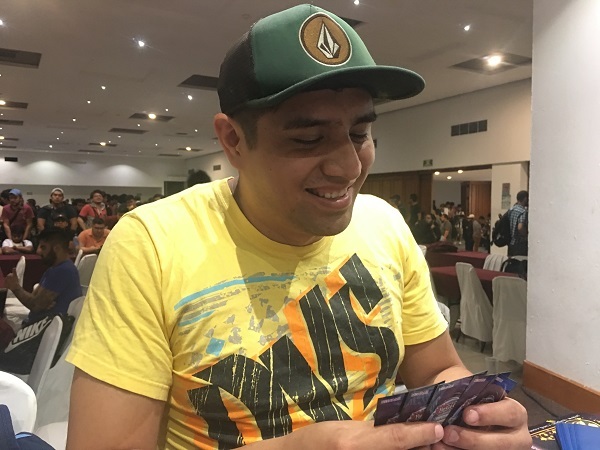 His opponent, Roger Guzman Garcia from Mexico City, Mexico is using the ever-popular Trickstar Sky Striker Deck. It’s time to Duel! Guzman Garcia started off the Duel by activating Trickstar Light Stage, using its effect to add Trickstar Candina from his Deck to his hand. 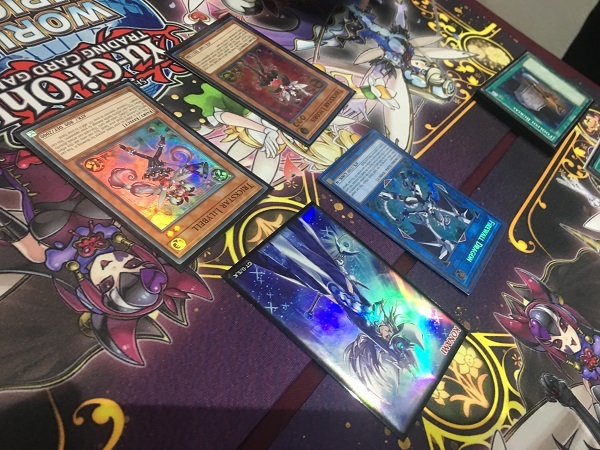 He activated Sky Striker Mecha – Hornet Drones next, and Special Summoned a Sky Striker Ace Token to his field. He used the Token to Link Summon Sky Striker Ace – Kagari and then used Kagari’s effect to get Hornet Drones back to his hand. He Summoned Candina and used Candina’s effect to add Trickstar Reincarnation to his hand and then used Kagari as a Link Material to Summon Sky Striker Ace – Shizuku. He returned Candina to his hand to Special Summon Lycoris next, and then Set 2 cards to his back row. He added Sky Striker Mobilize – Engage! to his hand in the End Phase with Shizuku’s effect. Madriz opened up with Pot of Desires, Allure of Darkness, Magical Abductor, Abyss Actor – Curtain Raiser, Majespecter Raccoon – Bunbuku, and Rescue Hamster. He Set Pot of Desires and Allure of Darkness and then activated Magical Abductor in his Pendulum Zone. He activated Curtain Raiser in his Pendulum Zone next, adding a Spell Counter to the Abductor, and then used Curtain Raiser’s effect to Special Summon it. He Normal Summoned Bunbuku next, using its effect to add another copy of Bunbuku from his Deck to his hand. He combined Curtain Raiser and Bunbuku to Link Summoned Heavymetalfoes Electrumite, and when he used its effect, his monster was destroyed by Ghost Ogre & Snow Rabbit. Nevertheless, Madriz was able to send Supreme King Dragon Darkwurm from his Main Deck to his Extra Deck with Electrumite’s effect. Madriz activated Rescue Hamster in his second Pendulum Zone next, adding another Spell Counter to the Abductor. He then flipped Pot of Desires, banishing the top 10 cards of his Deck face-down to draw 2 cards, gaining another Spell Counter. He removed 3 Spell Counters from Magical Abductor to add Harmonizing Magician from his Deck to his hand. Guzman flipped Trickstar Reincarnation, forcing Guzman to banish his hand of 4 Pendulum Monsters and draw a new hand of four cards. Madriz dropped down to 5200 Life Points due to the effects of Lycoris and Light Stage that activated throughout the entire turn. Madriz activated Allure of Darkness next, drawing 2 cards and banishing Timegazer Magician from his hand. He dropped down to 4600 Life Points along the way, and added a Spell Counter to his Abductor. He used another Allure of Darkness next, drawing 2 more cards and banishing Supreme King Gate Zero from his hand, while dropping down to 4000 Life Points. He Pendulum Summoned Darkwurm from his Extra Deck to his Extra Monster Zone, Curtain Raiser from his Extra Deck Linked to Shizuku, and a monster from his hand. He combined 2 of those monsters to Link Summon Heavymetalfoes Electrumite, and then used Electrumite’s effect to destroy his Rescue Hamster and add Chronograph Sorcerer to his hand. He Special Summoned the Chronograph Sorcerer and then Special Summoned Oafdragon Magician from his hand with its effect. He entered his Battle Phase and then attacked Lycoris with Electrumite to destroy it. Oafdragon attacked and destroyed Shizuku next, and then direct attacks from Chronograph and Curtain Raiser dropped Guzman down to 4300 Life Points. Madriz stood at 3200 Life Points, due to all of the Lycoris effect activations throughout the turn. Guzman activated Wisdom-Eye Magician in his Pendulum Zone, Set 2 cards to his back row, and then combined Chronograph and Oafdragon to Xyz Summon Norito the Moral Leader Linked to Electrumite. He combined the rest of his monsters to Link Summon Zefra Metaltron next. In the End Phase, Guzman activated Scapegoat, but its effect was negated by Norito. Guzman used Light Stage’s effect to target Madriz’s face-down Pot of Desires and then activated Sky Striker Maneuver – Jamming Waves! to destroy Madriz’s face-down Dragon Shrine. Guzman activated Sky Striker Mobilize – Engage! next, but it was negated by Norito. Next, Guzman activated Hornet Drones to Special Summon a Token and used the Token to Link Summon Kagari. He used Kagari’s effect to add Sky Striker Mobilize – Engage! to his hand, and then activated Engage to add Hornet Drones to his hand and draw a card. He activated the Hornet Drones to Special Summon a Token, and then Normal Summoned Trickstar Candina. He used Candina’s effect to add Trickstar Lilybell from his Deck to his hand and then Special Summoned Lilybell, prompting Madriz to concede. Adrian Madriz Espinoza opens big in Duel 1, but it’s not enough to defeat Roger Guzman Garcia! Roger Guzman Garcia is just one win away from the Top 4! Madriz opened up Duel 2 with 2 copies of Mythical Beast Master Cerberus, Rescue Hamster, Darkwurm, and Wisdom-Eye Magician. He activated a Cerberus in his Pendulum Zone and traded it in for a Mythical Beast Jackal King. He used the Jackal King’s effect to Special Summon Master Cerberus from his Extra Deck and then Normal Summoned Darkwurm. He combined his Master Cerberus with Darkwurm to Link Summon Heavymetalfoes Electrumite and activated its effect; but Guzman activated Ghost Ogre & Snow Rabbit to destroy it! Nevertheless, Madriz sent a Supreme King Dragon Darkwurm from his Deck to his Extra Deck with Electrumite’s effect before Electrumite was destroyed. Madriz activated Rescue Hamster in his Pendulum Zone next, and used its effect to add 2 copies of Darkwurm to his hand. He activated Gate Zero and Darkwurm in his Pendulum Zones next, and then Pendulum Summoned a Darkwurm and Wisdom-Eye from his hand. He combined his monsters to Link Summon Electrumite, and used its effect to send Chronograph Sorcerer from his Deck to his Extra Deck. He then used Electrumite’s effect to destroy Darkwurm and add Chronograph Sorcerer to his hand, and used Chronograph Sorcerer’s effect to Special Summon it. He Special Summoned Master Cerberus from his hand alongside it thanks to Chronograph Sorcerer’s effect. He drew a card with Electrumite, too. He activated Wisdom-Eye Magician in his Pendulum Zone, added 2 Spell Counters to his Master Cerberus, and then ended his turn. Guzman entered his Battle Phase and activated Evenly Matched from his hand! Madriz banished everything from his field except for the Electrumite, and Madriz drew a card with Electrumite’s effect. In Main Phase 2, Guzman Normal Summoned Trickstar Candina and activated its effect to add Trickstar Reincarnation from his Deck to his hand. He Set a card to his back row and passed his turn. Madriz drew Foolish Burial, adding it to his hand of Master Cerberus. He activated Master Cerberus in his Pendulum Zone and then used its effect to destroy it and add Jackal King to his hand. He drew a card with Electrumite’s effect, but lost his Electrumite to Ghost Ogre & Snow Rabbit. Guzman then activated Trickstar Reincarnation, forcing Madriz to banish his hand and draw a new hand of Bunbuku, Curtain Raiser, and Wisdom-Eyes Magician. He activated Curtain Raiser in his Pendulum Zone, losing 200 Life Points due to Candina, and then activated Wisdom-Eye, losing another 200 Life Points. He Pendulum Summoned Jackal King from his Extra Deck to his Extra Monster Zone and then Normal Summoned Bunbuku. He used Bunbuku’s effect to add another Bunbuku from his Deck to his hand, and then attacked Candina with Jackal King to destroy it. He attacked directly with Bunbuku next, dropping Guzman down to 6200 Life Points. Guzman Normal Summoned Candina and used its effect to add Trickstar Lilybell from his Deck to his hand. He Special Summoned Lilybell in Attack Position with Lilybell’s effect. He combined his 2 monsters to Link Summon Trickstar Holly Angel and then banished Reincarnation from his Graveyard to Special Summon Lilybell to his field, Linked to Holly Angel. Holly Angel’s effect activated, and then Lilybell attacked directly, allowing Guzman to add a Candina from his Graveyard to his hand. He Special Summoned Lycoris Linked to Holly Angel by returning Lilybell to his hand, once again triggering Holly Angel’s effect. Lycoris attacked and destroyed Bunbuku. In Main Phase 2, Guzman activated Pot of Desires, banishing the top 10 cards of his Deck face-down to draw 2 cards. He activated Terraforming next, adding Trickstar Light Stage from his Deck to his hand. He activated Light Stage to add Lycoris to his hand and then used Mind Control to take control of Jackal King! 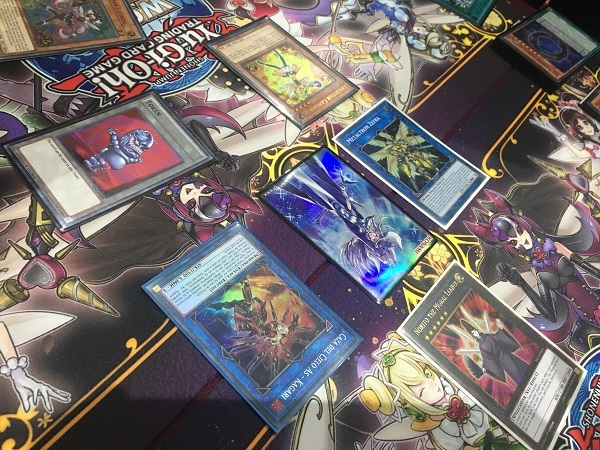 He used Jackal King and Lycoris as Link Materials to Link Summon Knightmare Goblin Linked to Holly Angel, and then discarded a Lycoris from his hand to gain a Normal Summon and Summon Candina next to his Goblin. He used Candina’s effect to add another Candina from his Deck to his hand and then combined Holly Angel with Candina to Link Summon Knightmare Unicorn. He used its effect to discard a card, shuffle Wisdom-Eye from the Pendulum Zone back into Madriz’s Deck, and draw a card. He Set a card to his back row and then passed his turn. Madriz drew Dragon Shrine. He activated it to send Darkwurm from his Deck to his Graveyard and then Special Summoned Darkwurm to his field, using its effect to add Gate Zero to his hand. He Summoned Bunbuku and then combined it with Darkwurm to Link Summon Electrumite. He used its effect to send Purple Poison Magician from his Main Deck to his Extra Deck, and then activated Gate Zero in his Pendulum Zone. He used Electrumite’s effect to destroy Gate Zero and add Purple Poison to his hand, plus draw a card. He played Purple Poison in his Pendulum Zone and then Pendulum Summoned Darkwurm and Jackal King from his Extra Deck, Linked to Electrumite, plus Timegazer Magician from his hand. He attacked Knightmare Goblin with Darkwurm to destroy it, and then attacked Knightmare Unicorn with Timegazer. He used the Pendulum Effect of Purple Poison Magician to allow Timegazer to prevail in battle, and the remaining attacks dropped Guzman down to 1300 Life Points. In the End Phase, Guzman flipped Scapegoat! Guzman combined his 4 Sheep Tokens to Link Summon Firewall Dragon and then Normal Summoned Lilybell. He attacked Jackal King with Firewall to destroy it, and then attacked directly with Lilybell, inflicting 800 points of damage to Madriz’s Life Points and adding Trickstar Lycoris from his Graveyard to his hand. He Special Summoned Lycoris behind Firewall Dragon by returning Lilybell to his hand, and then attacked Electrumite with Lycoris, destroying his own Lycoris. He used his Firewall Dragon’s effect to Special Summon Lilybell from his hand, and attacked directly, dealing 800 points of damage and adding Lycoris from his Graveyard to his hand. He Special Summoned Lycoris behind Firewall Dragon once again, attacked into Electrumite, and Special Summoned Lilybell from his hand with Firewall Dragon’s effect when the Lycoris was destroyed. He attacked directly once again for 800 points of damage, returning Lycoris to his hand with Lilybell’s effect. He Special Summoned Lycoris behind Firewall Dragon, and then attacked into Electrumite, Special Summoning Lilybell once again from his hand when Lycoris was destroyed. He attacked directly with Lilybell, returning Lycoris to his hand, and repeated this sequence a number of times to continue reducing Madriz’s Life Points! At the end of the loop, he returned Lilybell to his hand with Lycoris’s effect, and then used Lilybell’s effect to Special Summon it back to the field and deal the finishing 800 points of damage to Madriz’s Life Points! 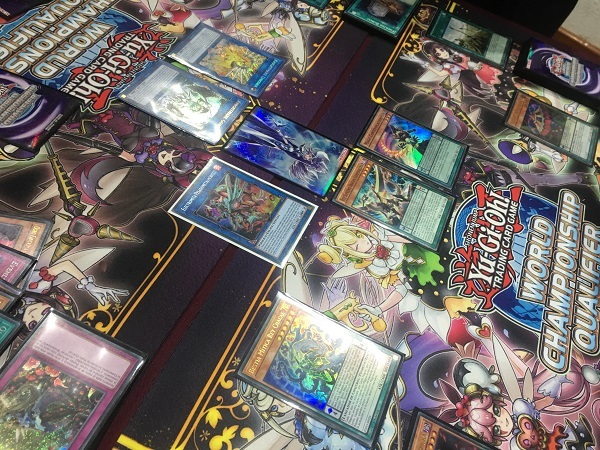 Roger Guzman Garcia is moving on to the Top 4 after using a loop involving Firewall Dragon, Trickstar Lycoris, and Trickstar Lilybell!